In preparation for the mediation, we encourage counsel to provide mediation briefs five days before the scheduled mediation. The briefs should try to explain the facts, relevant law and settlement position, as well as any other applicable information. It is important that counsel brings any evidence, demonstrative evidence, depositions and other things that will be helpful to their position. It is also important for the mediation to be successful that all parties try to exchange as much information as possible that will assist each side in understanding the other side’s position. A successful mediation involves the presence and participation of all decision makers and involved parties. We encourage you to arrange to have the appropriate individuals attend the mediation. Telephonic availability is generally a poor substitute for being there. All participants in the mediation will be required to sign an agreement which, among other things, maintains the confidentiality of the mediation. At the Mediation Offices of Steven G. Mehta, we want you to have a positive mediation experience. We want this positive experience to begin as early as booking a mediation with us. Our staff will assist you in finding a date that not only works for you but your client and opposing counsel. Throughout this process, our staff is available to answer any questions you may have. Our goal is to provide a comfortable, safe environment in which the parties can engage in an equally-beneficial examination and discussion of the issues of the case and find resolution to costly and stressful disputes. We begin the mediation by providing all parties with separate rooms. Private preliminary discussions with Mr. Mehta take place in which those unfamiliar with the process of mediation can gain an understanding of the process. We do not typically begin our mediations with all parties meeting jointly. Mr. Mehta, however, has a flexible approach and adapts his approach to each individual case. In most cases, when the mediation is not a joint session, please be prepared for “downtime” when Mr. Mehta is involved in discussions with the other parties and counsel. Many disputes are entrenched in miscommunication, misunderstanding or lack of communication. Mr. Mehta is an expert in communication having mediated thousands of disputes and led seminars on this subject. To help parties prepare for a negotiation process, he wrote his book 112 Ways to Succeed In Any Negotiation or Mediation. Steve Mehta’s mediations offer parties a safe, confidential environment in which their issues can be addressed, discussed and ultimately resolved. 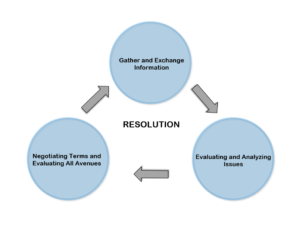 An average mediation is generally separated into three parts. These parts do not necessarily happen in a certain order. They are interchangeable and simultaneous. Mediations are often time-consuming. We offer four and eight-hour sessions. An average mediation takes about eight hours, but they can take longer. Please arrange your schedule accordingly or let your counsel and our office know in advance of any scheduling conflicts you may have. The mediation does not end at the end of the scheduled session — if a resolution does not occur within the session, which is quite rare, Mr. Mehta will follow-up either by email or telephone. He will do everything he can to make sure both parties are achieving a beneficial resolution. When the parties arrive at a resolution, they will either enter into a short-form document or a long-form document based on their attorney’s preference. We do however ask that attorneys have these documents readily available at the mediation. Lunch is provided during mediation. We also have snacks and beverages available throughout the day. Please be sure to let us know of any special dietary restrictions.